Ever wonder why it is that all kinds of insects stick to a spider’s web yet the spider moves about freely? Yeah, so did we! And in a summer filled with the study of insects and spiders, this was a perfect question to address at the McGaugh Academy this week. And when we wonder, or want to know why and how come, it is time for a science experiment! Courtesy of a special edition of Disney’s Family Fun magazine (currently on newsstands), I found a simple experiment, which we replicated today. We dipped our fingers in a little bowl of cooking oil. We discovered that oiled fingers can glide right over the sticky tape. Hm. It turns out that spiders have two means of not sticking to their webs. First, not every strand of their web is sticky, and spiders have a “memory” for which strands are sticky and which are not. Second, and most germane to our experiment: spiders coat their legs in a bit of natural oil, allowing them to glide about freely. To extend the lesson beyond the experiment, we used our field notebook, a.k.a. “Katie’s Nature Journal” as she wrote (with me giving her the letters, of course) on her title page. We dated the entry, she drew a picture of a spider, we answered three questions about facts we learned through our experiment, we saved a space to glue a picture of the experiment, and then we made a box in which to gather data. For our data, we chose to make a tally of how many webs we all could find in the backyard this morning. (We found eight, before Eric wanted his nap). The little people look for spider webs this morning. 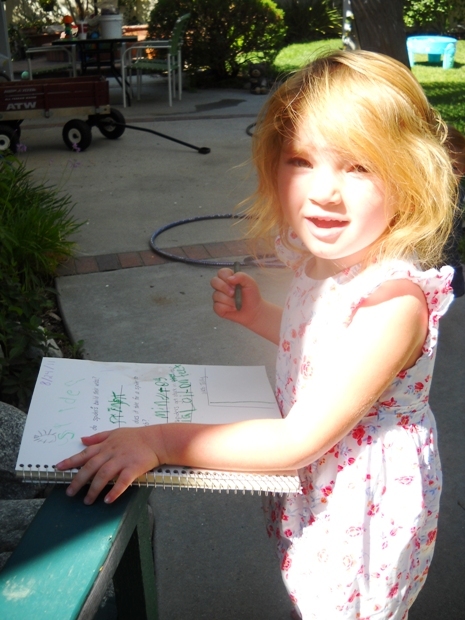 Making a tally in her field notebook/nature journal. I am sure we’re going to get quite a bit of use out of this nature journal. It is possible to do a small entry daily, even taping in things like pretty leaves or unusual finds, or making a note about which birds we see, or if we see the Eastern Swallowtail that likes to fly through the yard. Nature is an infinite source of learning and awe. I love how we can teach our children to zoom in and pay attention to all the beautiful details, to let that awe and wonder create lasting passion in them, an endless curiosity. We could also repeat the spider web tally monthly on the same date, and if we gathered enough data points, we could graph the results and see when spider webs are most prevalent. Always learning is always living.